After testing what seems like 387,001 monitors with AMD FreeSync support, I’ve finally got another honest-to-goodness Nvidia G-Sync one on my desk today, the Acer Predator XB241H – and boy, it’s a good ‘un. 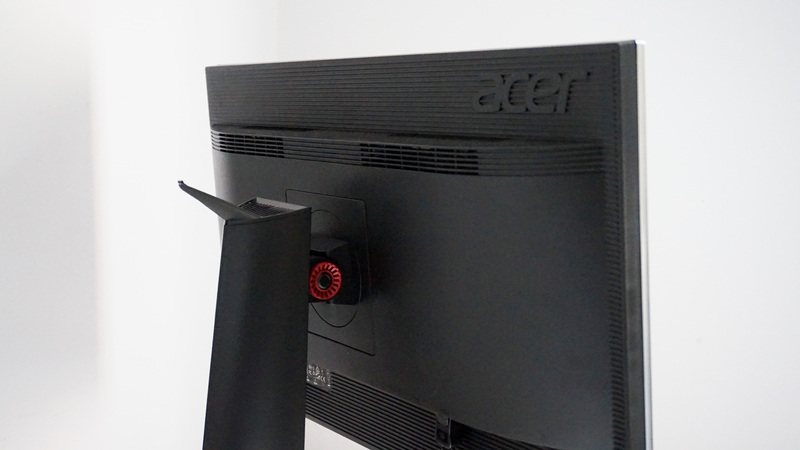 Part of Acer’s XB1 range, this particular incarnation is the 24in, 1920×1080, TN model. It also comes as a 24in, 2560×1440 jobber and several different permutations with 27in, 28in and 32in screen sizes, but the main attraction of this particular string of letters and numbers is its lovely 144Hz refresh rate that can be overclocked up to a massive 180Hz for ultra-high frame rate gaming. Admittedly, every model except the 4K XB1s can hit at least 144Hz, so you’re not exactly losing out on much in the frame rate department if you’d rather opt for a larger screen size or a higher resolution. However, if getting the fastest frame rate possible is important to you, it’s worth noting that the best overclocked setting you’ll get at 1080p on the XB1’s larger 27in panel is 170Hz, and just 165Hz across its 1440p options. Personally, I don’t think an extra 10-15 frames is really going to make that much of a difference, but the XB241H still has plenty to recommend it beside its ludicrous frame rate possibilities. For starters, it’s not hideously expensive as far as Nvidia G-Sync monitors tend to go these days, demanding around £380 in the UK and $395 in the US, and its TN panel is surprisingly decent for the money. No flashing LEDs here, no sir. Before I jump into specifics, however, a small (okay, large) word about what Nvidia G-Sync actually means. In a nutshell, this is Nvidia’s adaptive frame rate technology, which automatically adjusts the refresh rate of the monitor to match the number of frames being pumped out by your graphics card. This is meant to help eliminate screen tearing when it’s chucking out too many frames for the screen to handle, and will also help get rid of any unwanted stutter during small performance hiccups, leading to smoother, more fluid game playing. There are a few extra bonuses that come with Nvidia G-Sync panels as well. These include Ultra Low Motion Blur, which helps keep things looking nice and sharp (especially at higher refresh rates, where you can sometimes see a bit of a hazy trail if a monitor has particularly slow response times) and low input lag over DisplayPort. But the main thing is that dynamic refresh rate adjustment. You’re also likely to start seeing more G-Sync HDR monitors arrive over the coming months as well (just to make things extra confusing), which come with all of the bits of tech mentioned above as well as wide colour gamut and high dynamic range support. The XB241H isn’t one of these – it just has regular G-Sync – but you can read more about what HDR is and what G-Sync HDR monitors are all about by hitting those nice pink links. It’s also worth mentioning that G-Sync is a licensed, proprietary standard, and that every G-Sync panel has been pre-approved by Nvidia in advance, ensuring you get the same level of G-Sync experience no matter what monitor you end up buying. This usually adds quite the price premium onto your typical G-Sync monitor, making them much more expensive than their FreeSync counterparts. This is because FreeSync is an open standard, thereby making it significantly cheaper to implement. 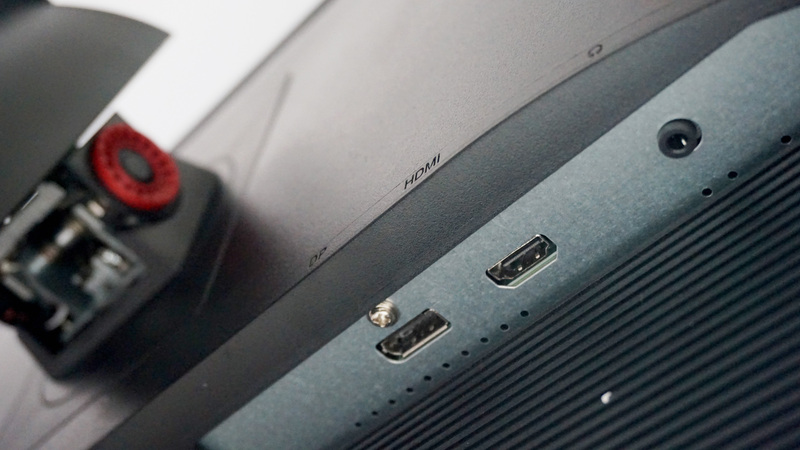 The downside is that you can’t guarantee every FreeSync monitor will deliver the same kind of quality, as sometimes its variable frame rate tech will only kick in within certain frame rate ranges, for example, with some being a lot wider and more generous than others. 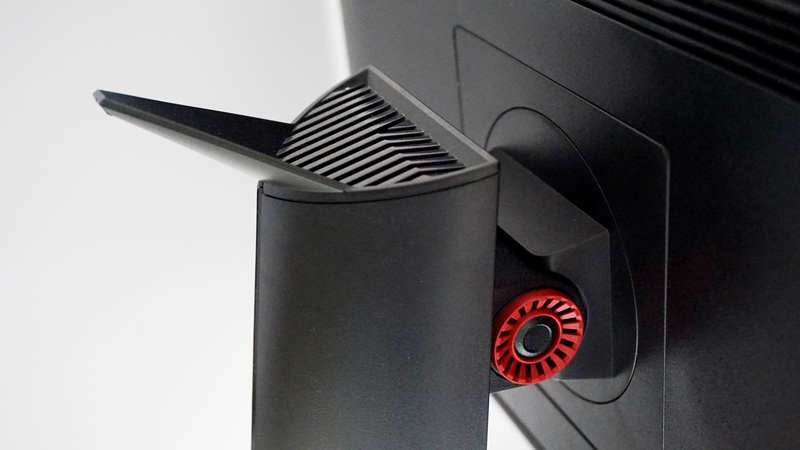 The XB241H has a nice little plastic prong to hang your headset on at the top of the stand. Needless to say, G-Sync only works with Nvidia graphics cards, while FreeSync is meant for AMD graphics cards. As such, the merits of one over the other can be a pretty moot point depending on what kind of graphics card you have, but it’s worth bearing in mind if you’re thinking about upgrading soon or want to learn how to build a new PC from scratch. So, now that we’ve got the G-Sync stuff out of the way, how about that TN panel? Well, I’m pleased to report the XB241H is really quite good. TN panels are typically known for their fast response times, not their colour accuracy. The latter tends to be a bit rubbish compared to fancier IPS screens, but my X-Rite i1 Display Pro calibrator showed that the XB241H can already show around 95% of the standard sRGB colour gamut straight out of the box. That’s using the monitor’s default User profile, but I got the same results when I switched to Standard as well. There are three other modes you can choose from here, including a dimmer Eco setting, a very sharp and slightly horrid-looking Graphics option, and a mildly oversaturated Movie mode, but I stuck with User for the majority of my testing. What’s more, I only had to make a couple of adjustments to the monitor’s colour temperature settings (selecting the User option and reining in the green value a bit) to push that sRGB figure a bit higher to an even more respectable 97.5%. That’s pretty great as far as sub-£400 / $400 TN monitors go, and infinitely better than the similarly G-Sync and 144Hz / 180Hz refresh rate-equipped Asus ROG Swift PG248Q. Admittedly, the Predator XB241H isn’t quite as bright as the ROG PG248Q, hitting a peak brightness of around 385cd/m2 according to my measurements compared to the ROG’s 500cd/m2, but that’s still more than enough for playing games when you’ve got blazing beams of sunlight coming in through a nearby window. Trust me, I’ve tried it. A marginally lower brightness level also means the XB241H has lower black levels (0.34cd/m2 vs 0.43cd/m2, the closer to 0.00cd/m2, the better) and a higher contrast ratio (a very pleasing 1117:1 vs a rather more middling 949:1), resulting in better-looking games with more detail in them. Of course, one of the downsides of TN panels is that, generally, their viewing angles aren’t as wide as IPS. Thankfully, this isn’t much of a problem on the XB241H, as its height-adjustable stand makes it super easy to get it into a good position. Yes, there’s a bit of colour shift at the edge of the screen when you look at it from the side, but really, who plays games without having their monitor directly in front of them? Plus, you also get lots of swivel, tilt and rotation adjustment thrown in as well, so you can even use the monitor in portrait mode if you want to. The only thing the XB241H really suffers from is a lack of ports. Just one HDMI, one DisplayPort and a combined headphone and microphone jack are all you get here, and that’s your lot. No USB hub, no extra HDMI. Nothing. To be fair, this will probably be fine in most cases (just remember to use the DisplayPort for those lovely high refresh rates), but hey, it’s always nice to have options, right? Still, as long as you don’t mind the slightly ‘gamer’ look of the whole thing (what with those red pronged feet, headset hook round the back and general boxiness of its bezels), the Acer Predator XB241H is a fine monitor indeed, and certainly one of the best gaming monitors I’ve seen at this kind of price range. At £380 / $395, the XB241H is also one of the better choices I’ve seen for those after a G-Sync screen on a (relative) budget, too – at least compared to larger G-Sync screens like the Acer Predator Z35p and AOC Agon AG352UCG. The Asus ROG Swift PG248Q is, admittedly, quite a bit cheaper in the US, but I still think I’d rather pay the extra $80 or so for the XB241H’s superior panel. The XB241H is definitely the way to go in the UK (here, the PG248Q costs £420), and it also doesn’t come with any distracting LED lights either. 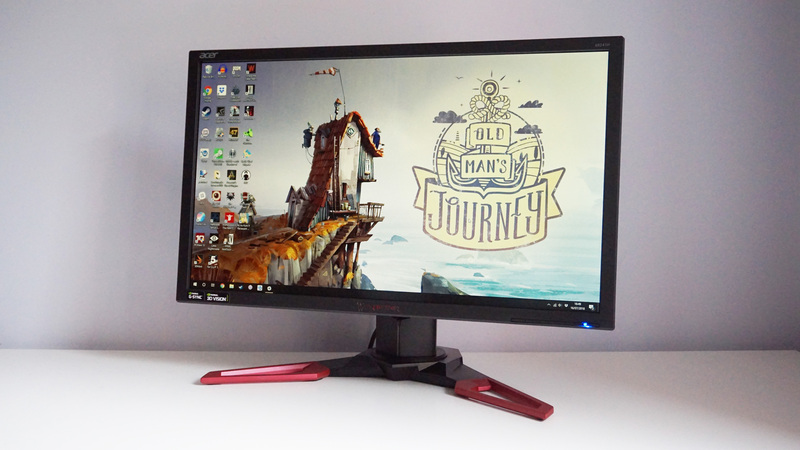 If you’re after a top quality 1920×1080 gaming monitor, the Acer Predator XB241H is a tough act to beat. Tagged with Acer, feature, G-Sync, Hardware, Monitors.